This local childcare and early education provider recently bagged an award hat-trick by being recognised as the nation’s Best Multiple Crèche for the third consecutive year at the Maternity and Infant awards in the Double Tree by Hilton Hotel in Dublin in October. Grovelands Childcare founder and managing director, Regina Bushell, and her daughter and marketing manager, Deirdre, look forward to hosting the next event which will be held on Wednesday, November 25, at 6pm. All are welcome to attend. 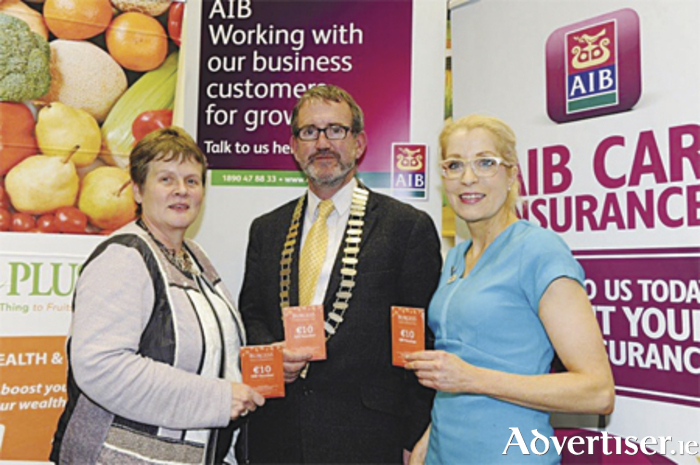 The last event was hosted by AIB Bank, Custume Place, and was well attended and informative. Joanne O’Connor, manager at the AIB branch, welcomed all and outlined the various initatives by which the bank is assisting SMEs. Elaine and Leigh Denby were on hand to outline the success of their involvement in Juice Plus, and encouraged everyone to attend one of many events held locally to see the benefits of the product itself and the business model which has enabled the success of this complementary business. Also in attendance were Denis Begley of DNG Begley and Stan Bradbury of Custume Property, who both gave an insight into both the residential and commercial property markets in the region. Michael Brougham of Enterprise Ireland outlined the importance of mentorship within the business community, and stated that it was one of the single most important contributors to a successful business ecosystem where both start-ups and SMEs can assist one another to thrive. He told those in attendance that job creation also flourishes where mentorship is encouraged and engaging.